A particle of activated carbon is mostly air. It has thousands of tiny holes and crevices through which water can circulate. When water carries an organic molecule-a contaiminant- into these narrow passage a short range attractive force between the molecule and the carbon will become effective and the molecule sticks. This particular method is call physical adsorption. The other kinds of absorption also involved with activated carbon are only minor importance to the eco-system. Safely clear tea colored pond water. Activated Carbon is highly effective at removing dissolved organics from the pond water, such as stains and discoloration caused by leaves and organic debris. Activated Carbon is is also an effective method to remove the build up of harmful chlorine and chloramines caused by city tap water. EcoCarbon high porosity activated filter carbon safely and quickly removes discoloration, unpleasant odors, and dissolved organics from pond water. 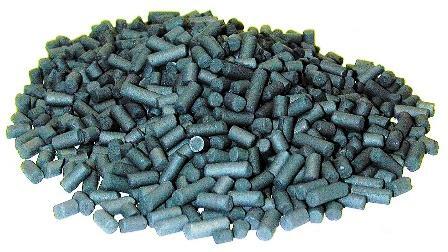 EcoCarbon works by adsorption, a process that allows discoloration and dissolved organics to accumulate on the microscopic pores and tunnels found within the activated carbon pellet. Just place the EcoCarbon in a place where the water pass by in great amounts. IE: Waterfall, Skimmer, or Stream. EcoSystems EcoCarbon is a safe, eco-friendly method for removing pollutants & heavy metals from pond water. EcoSystems EcoCarbon is manufactured using select grades of bituminous coal. The coal is heated to extremely high temperatures causing carbon to become “activated” like a magnet. Pollutants physically stick (absorb) to the surface of the EcoSystems EcoCarbon removing them from the pond water. EcoSystems EcoCarbon is highly porous and contains an enormous amount of surface area for the pollutants to adsorb. As a matter of fact, one pound of carbon contains the surface area equal to six football fields! EcoSystems EcoCarbon quickly clears water stained and discolored by leaves and organic debris. EcoSystems EcoCarbon is also an extremely effective method for the removal of both chlorine and chloramines caused by city tap water. The filtration capabilities of EcoSystems EcoCarbon depend on the amount of pollutants and dissolved organics present in the pond. The greater the levels of pollutants the quicker the carbon will be exhausted. It is best to remove as many leaves and debris as possible from the pond in order to increase the effectiveness and lifespan of the EcoSystems EcoCarbon. . Typically, 2 pounds EcoSystems EcoCarbon will treat a 800 gallon pond for 2-3 months. Treatment rates can be increased if necessary without any adverse affect on aquatic life. In some cases, such as discoloration, a one-time dose is all that is needed to remove unwanted substances from the pond. Simply leave the net containing the exhausted carbon in the BIOFALLS® as additional surface area for beneficial bacteria to colonize. The carbon can then be disposed of during the annual pond cleaning. Calculations: The number of gallons in a pond can be determined by taking the length (ft.) x width (ft.) x average depth (ft.) x 7.48. • Place the required amount of EcoSystems EcoCarbon in the provided mesh bag and tighten the drawstring on the bag. • Rinse the bag with tap water to remove any dust on the carbon. • The bag containing the EcoSystems EcoCarbon can be simply set on top of the media bags (lava rock) in the BIOFALLS®. This will provide the EcoSystems EcoCarbon with optimum water contact. How Much: 2 lbs. of EcoCarbon per 800 gallons of pond water. How Often: A one-time dose is all that is needed to remove unwanted substances from the pond. Note: Please make sure to store unused EcoCarbon™ in a sealed container. A: Brown or tea-colored water is generally caused from "tannins" in the water. As leaves or other vegetation accumulate and decay in the water garden, they begin to leech these tannins dying the water a brown or tea-color. Activated Carbon absorbs tannins and other toxins such as chlorine from city water. Place the activated carbon in a fine mesh bag and place in your skimmer or filter box. If you don’t have either of these, simply place it near your pump or in the area of your pond that receives the best circulation. The water must run “through” the carbon to work. Typically 4-6 lbs. will treat 1,000 gallons for 2-3 months. From Anonymous of Adrian, Michigan on 5/16/2016 . From Gerry of Scranton, Pennsylvania on 7/1/2015 . From Gwen Cord of Columbus, Indiana on 9/2/2011 .